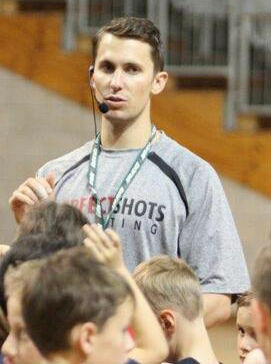 David Nurse is regarded as one of the top shooters in the world and top professional shooting and skills trainers for NBA players. He has helped develop some of the top shooters and players in the NBA and high level NCAA division 1 including Chris Lofton, Lee Humphrey, Aron Baynes, and Aaron Gordon to name a few. It is different to our usual workouts in that instead of shooting until the required amount of makes, you’re shooting for a set amount of time and counting the makes. Want to know why you should follow David’s workout? 1. Most college 3’s made in 1 minute. 2. Most NBA 3’s made in 1 minute. 3. Most consecutive 3’s in 45 seconds. 4. Most 3’s in 5 minutes. On that note, let’s jump into the workout! As stated above, this workout is timed. You will complete each drill for a certain period of time and then move on to the next one. ‘The Crunch Time King’ workout is short and sharp as you’re able to complete it in about 30 minutes when free throws are taken into account. Though this workout can be completed alone, a partner would help a lot with timing, keeping track of the number of makes, and writing them down. All drills are explained in the PDF which you can download below. 4. Two Ball, Two Chair Handoff Jumpers. 6. Two Ball Variety Pack. 10. 2 Ball Quick Release. Download and print out this workout to give to your players. Click here to download David Nurse’s Crunch Time King Workout as a PDF (Right click and click ‘Save Link As…’). To find out more about David and the services he can provide check out his website at http://www.perfectshotsshooting.com/free-training-video/. If you liked this workout why not share it with your coaching friends and also your players on social media? Hit either the Twitter or Facebook buttons to the left of this post to share it! Also, don’t forget to subscribe below so you don’t miss another workout!